TOKYO – A Japanese court on Wednesday turned down a class-action lawsuit seeking damages from nuclear plant makers Toshiba, Hitachi and GE over the Fukushima meltdown disaster, the plaintiffs, one of the companies and a report said. About 3,800 claimants in the suit, hailing from Japan and 32 other countries including the United States, Germany and South Korea, had sought largely symbolic compensation from the nuclear power plant manufacturers. Under Japanese liability law, nuclear plant providers are usually exempt from damage claims in the event of an accident, leaving operators to face legal action. The plaintiffs’ lawyers, however, had argued that that violated constitutional protections on the pursuit of happy, wholesome and cultured livelihoods. But the Tokyo District Court ruled that the law “is not unconstitutional”, according to lawyers for the plaintiffs. “We knew it was difficult to win under the current legal system in Japan, but it’s clearly wrong that nuclear (plant) manufacturers don’t have to bear any responsibility for an accident,” Masao Imaizumi, 73, one of the plaintiffs, told AFP. “If they are spared responsibility, it could lead to disregard for product quality,” he said, adding that the plaintiffs will appeal. “The company recognises the verdict as an appropriate ruling handed out by the court,” it said in a statement. Hitachi and GE’s Japan office could not be reached for comment. Japan’s Jiji Press also reported that the suit was rejected. The suit — which sought just 100 yen (96 US cents) per claimant — was the first to be brought against nuclear power-plant suppliers over the accident, Akihiro Shima, lead lawyer for the plaintiffs, said previously. The suit was first filed in January 2014 with just over 1,000 claimants, but more joined and the number nearly quadrupled. The plaintiffs had alleged that the companies failed to make necessary safety updates to the Fukushima reactors, swamped on 11 March 2011 by a magnitude 9.0 earthquake-sparked tsunami that lead to the worst nuclear accident since Chernobyl in 1986. Embattled plant operator Tokyo Electric Power is already facing massive lawsuits and compensation costs. The government body charged with decommissioning the reactors at the Fukushima Daiichi nuclear plant says it remains committed to removing the fuel but sealing off the buildings that house them could be an option. The Nuclear Damage Compensation and Decommissioning Facilitation Corporation issued its latest report Wednesday on its plan. It says 2 methods will be used to remove molten fuel depending on the condition of the reactors. One entails filling the containment vessels with water to shield workers from radiation. The second does not use water. The new plan also introduces the option of creating a “sarcophagus” to seal off the buildings with the nuclear fuel inside. This method was used at the Chernobyl nuclear plant in Ukraine. The plan favors removing the nuclear fuel because of the long-term safety issues involved with a sarcophagus. It urges a flexible review of all available options. It also notes the importance of addressing long-term public concerns about the plan. The government and the plant operator, Tokyo Electric Power Company, plan to decide by the middle of next year how to remove the fuel from the reactors. They hope to begin work at one of them by 2021. Reacting to the new plan, the heads of municipalities around the Fukushima Daiichi nuclear plant have urged the government to stick to its promise regarding nuclear waste disposal. The mayor of the city of Minamisoma, Katsunobu Sakurai, said the government and TEPCO must be made to abide by their initial pledge to remove the fuel from Fukushima Prefecture. Until this is done, he said, the evacuees won’t feel that it’s safe to return home. He warned against using the word “sarcophagus” lightly. He said its mention only points out the inadequacy of decommissioning technology. The mayor of the town of Namie, Tamotsu Baba, said a sarcophagus should not be considered because engineers are hard at work figuring out ways to remove the fuel. He said all they can do is to have faith that the initial pledge will be kept, even if it takes 30 or 40 years to remove the fuel. The mayor of the town of Okuma, Toshitsuna Watanabe, also urged the government and the utility to stick to their disposal promise. CLIMATE Record 9 hottest years in a row. Warning to Teresa May on climate threats to Brexit Britain. Democratic Senators naming and blaming the funders of climate science denial. USA media keeps the issue of climate change off the political agenda. Frivolous lawsuits aimed to attack climate scientists. Donald Trump’s real estate empire already suffering from climate change. NUCLEAR. Things are crook, very crook, for the uranium industry. UK. Chilcot says Britain shirking its responsibilty to help clean up radioactive destruction in Iraq. British Parliament to vote on renewing Trident nuclear missile system, as Brexit problems loom. Brexit uncertainty adding to anxiety of former supporters of UK’s Hinkley nuclear project. Renewal of Trident nuclear weapons system opposed by British Labour and Scottish National Party. Drigg Nuclear Waste Dump Menaced By Coastal Erosion: Foreign Companies Profit; UK Taxpayer Holds Liability. Britain’s nuclear submarines’ radioactive wastes will NOT be going to Scotland. USA. Renewables beat nuclear on economics, as Wall Street now finds. “Indian Point” New Documentary Investigates Nuclear Power from New York to Fukushima. President Obama ready to make policy changes to reduce role of nuclear weapons. Republicans trying to roll back the Iran nuclear agreement. Workers on strike at Hanford Nuclear Reservation due to health concerns. Department of Energy not able to meet deadline on demolishing Hanford’s Plutonium Finishing Plant. Connecticut lawmaker seeks justice over “stranded nuclear waste“. Old nuclear waste from Manhattan Project contaminating Niagara County. “Outrageous and Reckless Endangerment of Public Health” Proposed by US EPA: Increased Radiation in Drinking Water after Nuclear Accident. Sodium cooled nuclear reactors are not necessarily safer. Ratepayer ripoff: $19 billion nuclear plant for Virginia. Generous subsidies proposed for Upstate New York nuclear plants. JAPAN. Again, a Japanese court blocks restart of 2 nuclear reactors. Japan could change pacifist constitution after Shinzo Abe victory. Nuclear power opponent wins governor’s race in South West Japan. POLAND halts nuclear power plans, looks to renewable energy. IRAN. Forces in Iran trying to torpedo nuclear deal. AUSTRALIA. South Australia’s financially risky nuclear waste import scheme. Japan court again blocks restart of 2 nuclear reactors, Nikkei Asian Review, 13 July 16 OSAKA — Handed another defeat by a Japanese court on Tuesday, Kansai Electric Power likely will not be able to run any of its nuclear power plants for at least six months, a major setback for a utility facing intense competition from industry newcomers. The Otsu District Court in Shiga Prefecture rejected the company’s objection to an injunction issued in March that suspended operation of the Nos. 3 and 4 reactors at the Takahama nuclear plant in neighboring Fukui Prefecture. The presiding judge was the same as when the injunction was issued. Expecting this outcome, Kansai Electric has already started removing nuclear fuel from the two reactors. The Osaka-based company had been banking on the restart of nuclear power stations for an earnings recovery. Its medium-term business plan released in April set a pretax profit target of 300 billion yen ($2.87 billion) on the assumption that most of its nuclear reactors will be back online by fiscal 2025. Assuming that its earnings would improve by about 10 billion yen a month if the two Takahama reactors went back onstream, Kansai Electric had intended to lower its power rates to compete on a better footing with newcomers expected to enter the market following deregulation in April. But it was forced to scrap its plan to cut rates after the court ordered the two reactors — reactivated in January and February — shut down in March. Chilcot: UK refusing to help clean up Iraq after raining down radioactive shells https://www.rt.com/uk/350804-iraq-chilcot-depleted-uranium/#.V4VPdDurb8w.facebook 12 Jul, 2016 Britain has no intention of cleaning up its deadly radioactive legacy in Iraq or even monitoring the terrifying impact depleted uranium (DU) shells will have on the population in the future, it has been claimed. Writing in the Ecologist on Tuesday, Doug Weir, who is coordinator of the International Coalition to Ban Uranium Weapons (ICBUW), says that hidden within the Chilcot report is a previously classified military document setting out the UK’s rejection of any duty to cleanse Iraq of DU of unexploded ordnance (UXO). In it, the clearance of unexploded ordnance and DU is considered and the Ministry of Defence [MoD] argues that it has: “… no long-term legal responsibility to clean up DU from Iraq” Weir writes. This indicates, according to Weir, that the UK has effectively swerved any obligation to clear up after itself in Iraq. DU ammunition is used in only two UK weapons systems – the Royal Navy’s PHALANX Close-In Weapon System and in the Charm 3 ammunition fired by the Challenger 2 main battle tank. However, the route to shirking responsibility may not be as easy as the UK government seems to hope. In October, the UN will meet to debate a sixth resolution on DU weapons. It’s a move which will give succor to the government of Iraq, which in 2014 called for the international community to help clean up DU. Weir remains hopeful that the UN meeting may be able to encourage governments to take responsibility for the use and fallout of the weapons. “When the United Nations last discussed DU two years ago, 150 governments recognised the need for states to provide assistance to countries like Iraq,” he wrote. “This October, our Coalition will add our voice to those of the states affected by DU weapons in calling for an end to the use of DU weapons and for the users to finally accept responsibility for their legacy,” he added. Obama plans major nuclear policy changes in his final months, WP By Josh Rogin July 10 The Obama administration is determined to use its final six months in office to take a series of executive actions to advance the nuclear [disarmament] agenda the president has advocated since his college days. It’s part of Obama’s late push to polish a foreign policy legacy that is plagued by challenges on several other fronts. President Obama announced his drive to reduce the role of nuclear weapons and eventually rid the world of them in his first major foreign policy speech, in Prague in 2009. In his first years, he achieved some successes, such as the New START treaty with Russia, the Nuclear Security Summits and the controversial Iran deal. But progress waned in the past year as more pressing crises commanded the White House’s attention. Now, the president is considering using the freedom afforded a departing administration to cross off several remaining items on his nuclear wish list. In recent weeks, the national security Cabinet members known as the Principals Committee held two meetings to review options for executive actions on nuclear policy. Many of the options on the table are controversial, but by design none of them require formal congressional approval. No final decisions have been made, but Obama is expected to weigh in personally soon. Several U.S. officials briefed on the options told me they include declaring a “no first use” policy for the United States’ nuclear arsenal, which would be a landmark change in the country’s nuclear posture. Another option under consideration is seeking a U.N. Security Council resolution affirming a ban on the testing of nuclear weapons. This would be a way to enshrine the United States’ pledge not to test without having to seek unlikely Senate ratification of the Comprehensive Test Ban Treaty. The administration is also considering offering Russia a five-year extension of the New START treaty’s limits on deployed nuclear weapons, even though those limits don’t expire until 2021. This way, Obama could ensure that the next administration doesn’t let the treaty lapse. Some administration officials want to cancel or delay development of a new nuclear cruise missile, called the Long-Range Stand-Off weapon, because it is designed for a limited nuclear strike, a capability Obama doesn’t believe the United States needs. Some officials want to take most deployed nukes off of “hair trigger” alert. While no sodium-cooled reactors currently operate in the United States, the U.S. Department of Energy (DOE) is working with industry on a number of “advanced” reactor designs, including the Sodium-Cooled Fast Reactor (SFR). One of the SFR’s safety advantages, to quote the DOE, is that the design provides a “Long grace period for corrective action, if needed.” SRE’s meltdown transpired over a two-week period. Fermi Unit 1 had indications of inadequate core cooling in June that were repeated in August and dismissed until extensive damage occurred in October 1966. The “if needed” grace period is never long enough when warning sign after warning sign is dismissed or ignored. DOE did acknowledge some “challenges” for the SFR: their higher speed and higher energy neutrons can embrittle and degrade nearby materials, liquid sodium coolant reactors with air and water and degrades concrete, and the opaqueness of the liquid sodium coolant complicates in-service inspections and maintenance. Poland’s largest utility Polska Grupa Energetyczna (PGE) is not giving up its plans to build the country’s first nuclear reactors but the investment may be modified and will not be realized until after 2030, PGE’s chief executive Henryk Baranowski said Tuesday……..
the company was looking at other means of financing the nuclear project after the PiS government, which took office last November, rejected contracts for difference. In terms of renewable energy Baranowski said PGE was interested in developing offshore wind in the Baltic Sea. Work stoppage continues at Hanford Nuclear Reservation http://q13fox.com/2016/07/12/work-stoppage-continues-at-hanford-nuclear-reservation/ JULY 12, 2016, BY ASSOCIATED PRESS SPOKANE, Wash. (AP) — A rare work stoppage continues by some Hanford Nuclear Reservation workers who contend that radioactive wastes left from the production of nuclear weapons are making them sick. Union president Dave Molnaa, who ordered the work stoppage, said it will continue until all employees are provided with bottled air when working around all of the underground nuclear waste storage tanks on the Hanford site. Workers have contended for years that chemical vapors escaping from the tanks are making them sick. 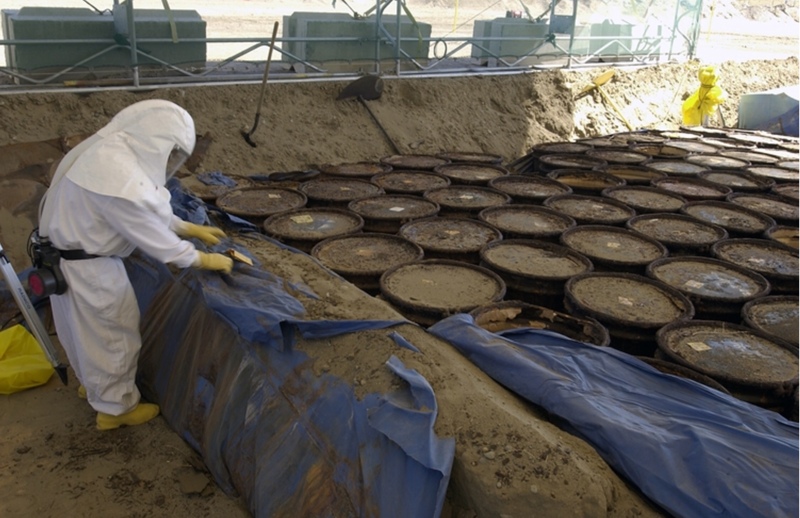 The steel tanks, some dating back to World War II, contain wastes created by the production of plutonium for nuclear weapons. The Hanford Atomic Metal Trades Council, a coalition of 15 unions that represent workers on the site near Richland, issued the “stop work” order on Monday morning. Connecticut lawmaker pushes nuclear waste bill http://wtnh.com/2016/07/12/connecticut-lawmaker-pushes-nuclear-waste-bill/ By Keith Kountz July 12, 2016 New Haven, Conn. (WTNH)– Connecticut congressman Joe Courtney is part of a bi-partisan group of house lawmakers to introduce a bill to help communities that are struggling with the cost of storing what’s known as ‘stranded nuclear waste’. The legislation is important to people in Courtney’s district, which includes the former home of the Connecticut Yankee nuclear power plant. The Stranded Nuclear Waste Accountability act of 2016 would help communities cover any losses they’ve racked up associated with the storage of nuclear waste. In a statement, Courtney says in part that ‘we cannot allow small communities and municipalities across this country to fall into financial distress because of the congressional gridlock which is holding up the establishment of a federal nuclear waste storage facility’. Australians have been both helpers and victims of the fossil fuelled web of climate science denial being detailed in the U.S Senate, Guardian, Graham Readfearn, 12 July 16, By the middle of this week, about 20 Democratic Senators in the US will have stood up before their congress to talk about the fossil fuelled machinery of climate science denial. 2014 and 2015 each set the record for hottest calendar year since we began measuringsurface temperatures over 150 years ago, and 2016 is almost certain to break the record once again. It will be without precedent: the first time that we’ve seen three consecutive record-breaking hot years. With the Earth warming dangerously rapidly, at a rate 20–50 times faster than the fastest rate of natural global warming, one can’t help but wonder when the influence of the small minority of disproportionately powerful climate denial groups will wane. 195 countries pledged to curb their carbon pollution in the tremendously successful Parisclimate negotiations, but climate denial is still predominant in one of America’s two political parties, and may be gaining foothold in other regions of the Anglosphere like the UK and Australia. Fortunately, many other countries like China, India, and Canada seem to be moving in the right direction with their climate and energy policies. Decaying concrete raising concerns at Canada’s aging nuclear plants, National Post Ian MacLeod, Postmedia News | July 8, 2012 Decaying concrete at nuclear power plants is the latest concern for nuclear safety authorities. At Quebec’s sole atomic power station, Gentilly-2, eroding concrete has prompted federal licensing officials to suggest that any provincial attempt to refurbish and re-license the 30-year-old plant must satisfy federal concerns over the aging concrete’s ability to stand up to another two or three decades of service. The move comes as economic pressures force nuclear utilities to consider refurbishing their nuclear plants and operating them well past their 25- to 30-year initial lives. With Gentilly-2 at the end of its service life, the Quebec government is under pressure to decide soon whether to order a refit or shut down the plant permanently. Refurbishment estimates range from $2 billion to $3 billion. A shutdown is pegged at $1.6 billion. Of particular concern for any “life extension” is the dome-shaped containment building that encloses the 675-megawatt CANDU 6 reactor. The metre-thick, steel-reinforced concrete structure serves as the final physical barrier against radioactive contamination escaping into the atmosphere around Becancour, on the south shore of the St. Lawrence River across from Trois-Rivieres and an hour’s drive northeast of Montreal. “Special attention is needed for the containment structure in the longer term since it has been identified that containment concrete suffers from” a common type of concrete decay called alkali-silica reaction (ASR), says a 2010 report by the Canadian Nuclear Safety Commission (CNSC) in Ottawa. When Theresa May takes over as prime minister of Britain on Wednesday, climate change might not be top of her agenda. The former home secretary has to renegotiate relations with the EU, the rest of the world and heal a divided country. But the impacts of global warming are not going away, a report by the independent Committee on Climate Change (CCC) warns. Heatwaves like the one that killed an estimated 2,000 British citizens in 2003 are projected to become the norm by the 2040s. To prevent more excess summer deaths, government needs to regulate for cooler buildings today, the CCC advises. It is one of six priorities for action, in a review of evidence pulled together by 80 authors over three years. Many of the issues are unchanged since the CCC last undertook a similar assessment five years ago. While May has not been vocal on the issue, as a member of the National Security Council, she was involved in a 2015 review that outlined how global warming could trigger political instability, conflict and migration. More than five years after the devastating tsunami and the 8.9-magnitude earthquake struck north-eastern Japan, causing the explosion of the nuclear power plant in Fukushima, the Japanese town remains abandoned. Since April 22, 2011, an area within 20km (12.4miles) radius of Fukushima Daiichi Nuclear Power plant has been cordoned off from the public and listed as the red exclusion zone. But now, Malaysian photographer Keow Wee Loong has entered into the exclusion zone to capture these eerie images.